Join us for a special program that explores the history of Augusta Allen’s original Woodstock Dress presented by Woodstock Town Historian, Richard Heppner and, for the first time in eighty years, the unveiling of the “reimagined” Woodstock Dress as designed by Sarah Stitham of Workday Wear. Join us for a special program that explores the history of Augusta Allen’s original Woodstock Dr ess presented by Woodstock Town Historian, Richard Heppner and, for the first time in eighty years, the unveiling of the “reimagined” Woodstock Dress as designed by Sarah Stitham of Workday Wear. Augusta Allen, born in 1869 and raised as a child along the Ohio frontier, arrived in Woodstock, NY with her husband, artist and entrepreneur, Willard Allen. Urged to make Woodcock their home by artist Birge Harrison, the couple, upon their arrival, constructed a remarkable three-story home known as Allencrest. As time progressed, however, declining family fortunes would call upon Augusta to put her considerable skills as a seamstress to work, in an effort to support her growing family. No stranger to hard work – family members recall hearing the treadle sewing machine she used whirring well into the early morning hours - Augusta drew upon the early lessons of the frontier and an innate creativity to fashion what would become known as the Woodstock Dress. The dresses, made of cotton, velvet, taffeta and other select types of fabrics were soon in high demand by the women of Woodstock. It could, for example, be either a casual everyday dress to wear to market or easily worn formally at a reception. The dress became a favorite of women within the art colony and was also worn by many of the Cheats and Swings square dancers during a number of exhibitions, including one memorable performance for Franklin and Eleanor Roosevelt at their home in Hyde Park. The Jennifer Maidman Band with special guest Elly Wininger will kick off The Historical Society of Woodstock's 2019 celebration of the town's 400-year history in the field of music on Friday, May 24 with a benefit concert at the Christian Science Church, 85 Tinker Street. Maidman, a versatile UK and US based instrumentalist, singer-songwriter and producer, is currently a member of The Orchestra That fell to Earth (the original Penguin Cafe Orchestra), Soupsongs (the music of Robert Wyatt), the Murray Head Band, the Terry Reid Band and the reformed seminal 1970s funk soul ensemble Kokomo. She enjoyed chart success from the start of her career by recording and mixing Marc Bolan's “I Love to Boogie” in 1976. She has performed with Joan Armatrading, Bonnie Raitt, Mark Knopfler, Gerry Rafferty, Van Morrison and Boy George. Elly Wininger, a 2014 inductee into the NY Blues Hall of Fame, got her start in the coffee houses of Greenwich Village and has deep roots in Woodstock. Her CD, Little Red Wagon, hit #8 on the Folk Music DJ Chart in 2018. Having played historic NYC venues, Elly now tours nationally and is an annual feature at the Woodstock Invitational Luthier's Showcase. Festival promoter Kurt Henry called Elly a “folk-blues legend.” She was the first artist to perform at CBGB and was offered a recording contract with Red Robin Records at age 16. For more about Elly Wininger's impressive career, see http://www.ellywininger.com/bio.shtml. 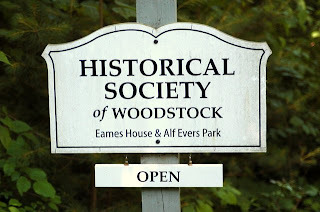 The concert is the first in a series of events planned by the Historical Society of Woodstock to complement the 2019 exhibit, Woodstock Music: In Tune with the Times, 1600 – Present, which previews at the HSW's Eames House Museum on June 15 from 12-4 pm with a talk by Woodstock musician Rennie Cantine. The exhibit is open June 29 to September 1st, on Saturdays and Sundays from 1-5 pm.